Bodeefit is a free fitness app for Windows 8 and 8.1; for people looking for a personal fitness trainer who does not tell them to use any kind of fitness equipment. To access Bodeefit, you will have to sign in to your existing account or make a new Bodeefit account with your email address or with Facebook. Once you have created your Bodeefit account and logged in, you will be taken to the dashboard that will show the training or exercise for the day. 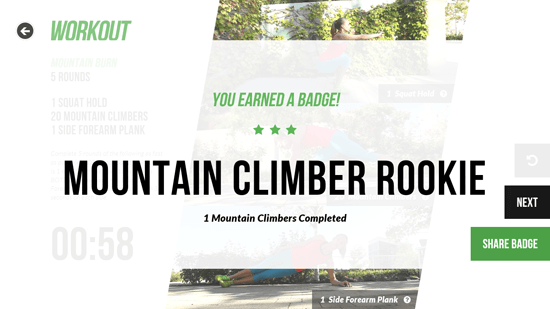 The workout session can be started by clicking on “Start today’s workout” button on right side, when you click it another page open where you are shown the details about the workout session with the help of image or a GIF on it. 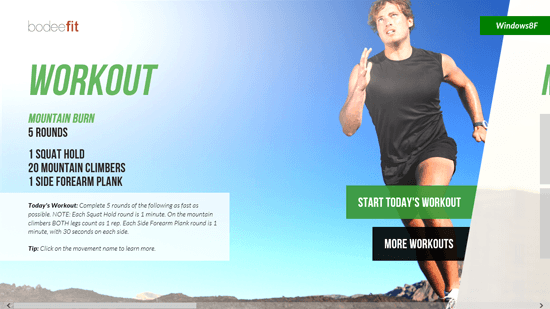 You can click on the Start button to get started with the workout, a timer will start for each workout session. You can pause a session in between by clicking on the pause icon, restart the session by clicking on the reload icon and click on finish once you have completed the given task. When you click on the Finish button, a pop up will appear telling you the time you spent to complete the task or the given exercise in the workout. You can click on confirm and save workout to save the information in the app. You will earn the badge on completing the task, you can share the badge with your friends by email. The best thing about Bodeefit fitness app is that you don’t need any kind of equipment or professional trainer to train. All the tasks and exercises mentioned in the app everyday are based on the simple body exercises such as dips, planks, push ups, pull ups, squat, etc. The app is meant for everyone who want to exercise and keep themselves fit but don’t have time to go to the gym or have professional training.